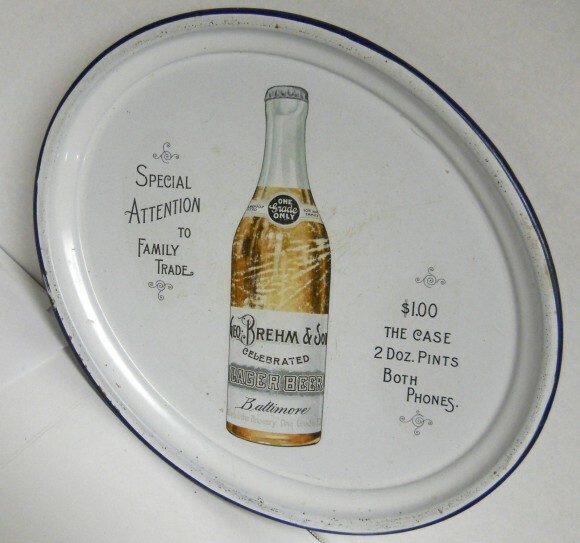 Serving Tray for Geo Brehm & Sons Celebrated Lager Beer showing in the center a bottled beer from the company. Texts on either sides state Special Attention to Family Trade / $1.00 The Case 2 Doz. Pints Both Phones. This tray is unique for the fact that the text and bottle are not oriented perpendicular to the axes of the oval, so in order to read it the tray is tilted at a 45 degree angle or so.